$ 40.00 - SOLD - Thank You. Contemporary Art Glass plate by " Andreas Meyer." He is a well known glass artist working at the "Nahariya Glass Factory"in Northern Israel. 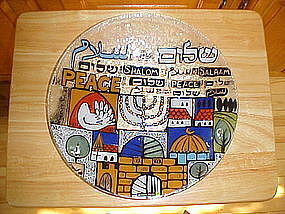 The theme of this plate is " PEACE." It measures 12 1/2" in diameter and it resembles a stained glass window. A Beautiful piece!! !